A clean up operation on Helen Island near Sea Otter Cove. Twenty such operations bagged an estimated 10 tonnes of debris. Photo courtesy Living Oceans website. 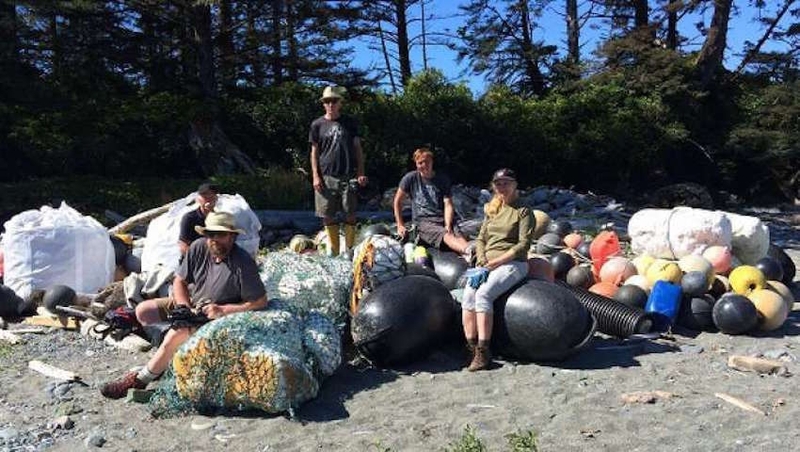 An environmental group says it has recycled almost three quarters of the tonnes of garbage scavenged this year from the beaches of Vancouver Island's west coast. Living Oceans says just 11.2 tonnes of the 40 tonnes of washed up trash had to be sent to the landfill after being barged to Delta for sorting. Spokeswoman Karen Wristen says the public eagerly helped sort the garbage, taking home fishing floats, barrels and other items. She says several businesses also claimed tonnes of hard plastic, drink containers, metal, tires and Styrofoam, keeping most of those items out of the dump. Sorting the garbage in the Vancouver area instead of Vancouver Island, where it was done last year, was more effective. Wristen says most of the garbage collected in the 2015 drive ended up at the landfill. The annual collections have been funded by a variety of sources, including a gift from the government of Japan following the 2011 tsunami, but Wristen says all the money from Japan has been spent. "We could not have pulled this off without the generosity of all of the partners and contractors involved, as well as our own supporters," she says. Living Oceans says 2016 costs, including use of helicopters to move loads of trash from remote areas to the barge, are over budget at $131,000 and a benefit concert and silent auction will be held Saturday in Vancouver to help make up the difference.